The Small Animal Imaging Facility (SAIF) provides in vivo functional and anatomical imaging and image analysis for cells, tissues, and small animals, primarily mice and rats, but also primates. The assets of the SAIF include state-of-the-art instrumentation and a nationally recognized staff. The lab has a MOLECUBES PET/CT imager installed since June 2017. How would you rate your experience with MOLECUBES? What specific feature do you like the most? Which Applications do you run on the B-cube? Would you choose for benchtop instruments again and why? How often are the instruments used? Investigation of inflammation in osteoarthritis of the jaw performed by Megan Sperry and Beth Winkelstein PhD of the Spine Pain Research Lab and Eric Granquist, DMD, MD, Director, Center for Temporomandibular Joint Disease. 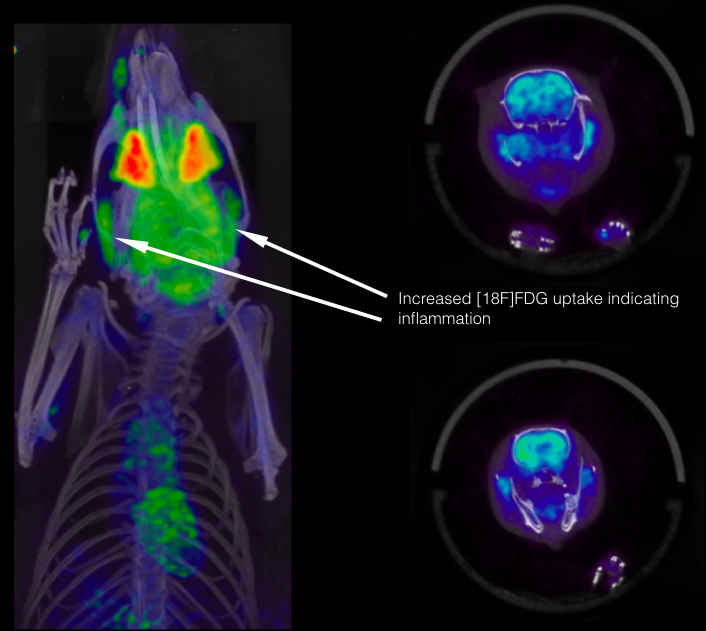 ~600 uCi FDG was injected in a rat, a single bed position acquired 1 hr post injection for 15 minutes, registered with a whole body general purpose CT. Selected views from a baseline scan are shown below.